When I first entered the working world less than two years ago, I suddenly found myself with a lot more disposable income than I used to have as a student. Thrilled with my newfound purchasing power, I began to splurge on the things I used to not be able to afford. Thus, I ended up saving very little. It took me a few months to wake up my idea and get serious about saving for the important things ahead – marriage, buying a house and retirement. Looking back, I would definitely have benefited from the advice of more financially-savvy seniors. Thus, I hope to share my personal experience here to help my peers and juniors avoid the same mistakes I made. The saying, “If you fail to plan, you plan to fail” is often repeated but it is true. I only started to save seriously when my partner and I sat down to draw up our financial plan and commit to these goals together. First, we listed out the things we had to save for and how much each would cost – Our HDB flat (downpayment, renovation) and wedding (pre-wedding photos, ceremony, honeymoon).We found the First Home Calculator useful in this process. Through using the calculator, my partner and I were able to estimate the housing loan based on our income, monthly expenses and ability to service the loan. Then we divided the components into what could be paid in cash and what could be paid using our CPF. 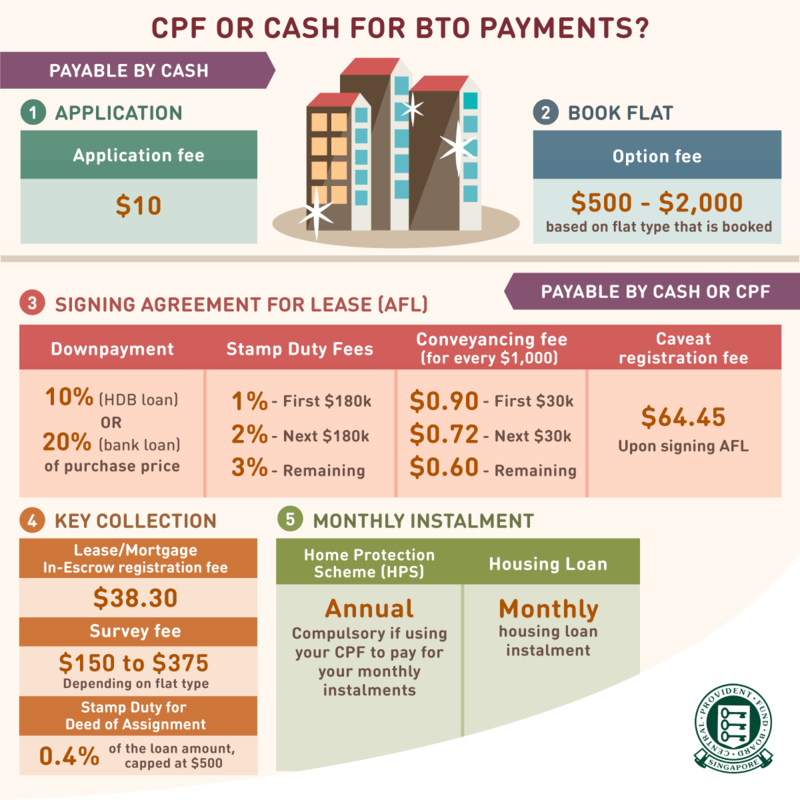 Refer to the graphic below for more information on the payments you can use CPF or cash for. Then, we did the same for our salaries. Firstly, we calculated how much cash we would have left after contributing to our CPF Account (80 per cent of our monthly income). Then we calculated how much we would contribute to our CPF per month – 17 per cent from our employers and 20 per cent of our own income. 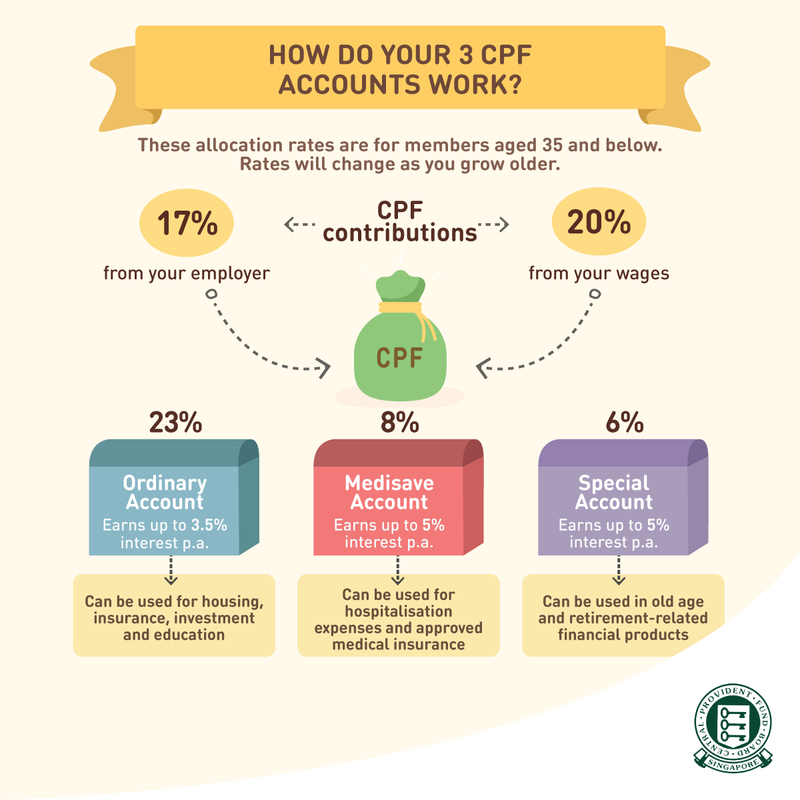 From there, the combined CPF contributions will be allocated to three accounts – Special Account, Medisave Account and Ordinary Account – according to these rates. Every month, about 23 per cent of your income gets allocated into your Ordinary Account from your CPF contribution. While it might seem like a small sum per month, the cumulative effect is significant given that the Ordinary Account earns up to 3.5% interest per annum, more than what most banks can give you in Singapore. From there, we worked out how much we could save per month after deducting our fixed monthly expenditure, such as phone bills, gym membership, expenditure on food and monthly allowance for our parents. This gave us an idea of what would be a reasonable sum we could each save per month to contribute towards these goals. To find out why my money had disappeared without my realisation, I looked through the past expenditure records and was shocked to find that I had spent mostly on food without even realising it. All these were incurred during outings with my friends and partner when we visited cafes and bars during the weekend. Admittedly, it is hard to resist the temptation of visiting nice places to eat during the weekends. This is especially so with the constant gorgeous stream of photos of cafes and food flooding our Instagram feed. For instance, a meal and drink for one could cost up to $25 per visit. In contrast, a simple meal and drink at the hawker centre will only cost you $5 or less per person – 5 times cheaper but just as delicious! Besides food, another area to save on would be coffee. Instead of visiting expensive establishments like Starbucks, try to drink coffee provided in your pantry or opt for cheaper alternatives such as coffee from the ‘kopitiam’. Another significant expenditure of mine went to online shopping. Due to the numerous mailers that I had signed up for, I was constantly updated of the latest products and sale events. This made it very tempting for me to spend. I learnt my lesson hard one day when I realised that I had spent a whopping $250 just on new clothes in a month. This filled me with guilt and regret for the rest of the month. To make up for it, I tried to scrimp and save to ensure I could still meet the saving target I set for myself. Eventually, I decided that perhaps “prevention is better than cure”, so I made the bold move of unsubscribing from the mailing lists of all blogshops and unfollowing these pages on Facebook and Instagram. However, if you consider this move too drastic for you, you might consider either only subscribing to 1-2 of your favourite shops. Or, you could opt for online payment platforms or credit cards that offer you cash back rewards when you spend. Speaking of credit cards, before you decide to get one, always compare online to make sure you’re getting your best bet. Besides making an effort to save, it is also important to think about how you can increase your income. One advice I got from seniors was not to stay in my first job for too long to avoid your income from stagnating. In fact, research has shown that employees who stay in a company for longer than two years get paid 50 per cent less. For instance, let’s say your starting salary as a graduate is around $2,800. Assuming that you get a 5 per cent increment per year, your salary after two years is $3,087. However, if you join a different company with two years of experience, you might get a starting pay of $3,600. That is almost 20 per cent more than if you stayed with the same company. One way to attract good job opportunities is to optimise your LinkedIn profile as research has shown that 87 per cent of recruiters use LinkedIn to source for candidates. I personally know a friend who doubled his monthly income after securing a new job through LinkedIn, with only one and a half years of work experience. Of course, don’t solely take your annual income into consideration when planning your career. Do think about other factors that are important to you, such as your long-term career goals (knowing which industry you want to explore, skills you want to hone); working environment; career progression and learning opportunities. Similarly, I’ve switched jobs and am now in a role where I really enjoy coming to work every day because of the fantastic culture and colleagues. I have a great boss, work-life balance, better compensation, and opportunities to grow. Ultimately, decide what you deem is best for yourself. It is my personal belief that young adults should plan to travel while they are still young and if they have the financial means to do so. Once you get bogged down by bigger commitments later on in life, and start to grow old, you will no longer have the luxury of time and optimum physical health to enjoy these adventures. However, this does not mean that you should adopt the YOLO (‘You Only Live Once’) mentality and splurge on travelling without saving. After all, there are several methods to save money while travelling, previously covered on my blog. For instance, one could opt for free walking tours when visiting cities, instead of hiring a guide or taking a tour bus. You get to burn calories by walking, learn about a city and also take gorgeous pictures. Check out some photos of the free walking tour I took in Moscow here. One could also choose to travel to cheaper cities such as Hanoi or Harbin. If you would like to go to Europe without breaking the bank, why not consider a country like Russia over the more expensive European destinations? The Russian Ruble currency rate has dipped significantly against the Singapore dollar. Last year, my partner and I booked a tour package to Moscow. The 9-day trip only cost us $1,600 for a four-star hotel and a two-way SIA flight. It takes just a few little steps each day to save. Just remember to spend wisely because there is a future ahead of you. Trust me, you’d definitely thank yourself for being prepared! What do you think of these tips? Do you have any personal experiences or advice to share? Let us know in the comments below! How I keep my utilities bill below $50 every month?